Mr.Papi (red ball guy) fights with many enemies. His weapon is a spiky ball with a rubber rope! Brandish the spiky ball and defeat the enemies. Move a mouse cursor to move him. To brandish the spiky ball well, you may draw circles repeatedly in a suitable cycle. 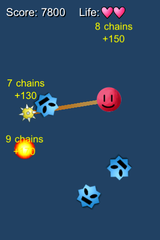 If you defeat many enemies at once, you get chain bonuses. If enemies touch Mr.Papi three times, the game is over.